Our lucky 13th mix comes just after Halloween, and in fact after the one year anniversary of this mix series. If you’ve been enjoying these forays into creative and sometimes challenging musics, please help spread the word and share these sounds. This latest mix is perhaps our most challenging yet, which is saying something coming on the heels of two mixes by SEC_. Shay Nassi aka mise_en_scene first appeared on our radar when he did an interview at our old stomping ground The Silent Ballet , and has continued to hold our attention with recent work including a cassette-release and collaboration with Steven R. Hess. By the way, for those who may not know, mise-en-scène is French for “placing on stage,” and is the term used in film and theatre criticism to describe the various constellations of design elements that make up a work. I am Shay Nassi from the city of Tel-Aviv in Israel . My project is mise_en_scene. When did you start doing mise_en_scene? mise _en_scene started in 2006. What’s your musical background like? I began studying the art of sound engineering at Jordan Valley College in the north of Israel, where I gained a degree in Practical Sound Engineering. I do not have a musical background in the classical way of thinking. I’m not playing any instrument except computer and my modular synth. I produce and collect sounds and create a sort of archive of them. I produce them by modular synth and other gears. Then I compose for new experiments combined with the sounds from the archive I built. How do you understand or situate your work? 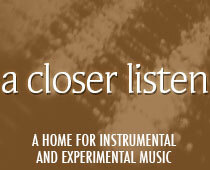 My work originates from impulse to composition and research of music. I work totally intuitively. You’re from Tel Aviv, which has a big electronic dance music and club scene as well as a big art scene in general. How is the experimental electronic scene there? As far as I know, it is a very small scene. I am not involved in the experimental electronic scene here in Tel aviv and my work is more known outside of Israel. The mix is compiled from some old and new tracks, mostly electronic,experimental stuff. Materials that I listen to recently.